Is the free trial somehow limited? I paid for a license, but never received the key. What happened? I lost my license key. Can you mail it to me again? I own a beaTunes 4.x license - why should I update to beaTunes 5? beaTunes claims that there is a newer version available. What now? My version of beaTunes is expired. What now? Something does not work. Where can I get support? What BPM is suitable for what kind of fitness workout? Do I need iTunes to run beaTunes? Yes. In two ways: time and functionality. The trial version will expire after 2 weeks. You can use the inspection feature to find issues, but you cannot apply any solutions. Also, beaTunes will only identify up to 10 songs in each session. All limitations are lifted once you purchased a license. Our license key email probably got caught in your spam filter. So before you contact us, please make sure to check your spam/junk folder for email from either the tagtraum.com or the beatunes.com domain. If you cannot find it in your spam folder, try our lost key form. If the form fails, too, please contact us. Note, that if our emails to you are filtered out by your spam filter, we have no way of communicating with you. This means that if you contacted us via email and we answered, you might never receive our answer due to your spam filter. Please use our lost key form. If you are unable to get to your key using the form, please contact us. I've put a lot of work into beaTunes 5 and really believe it's worth buying an upgrade. Doesn't that sound like a good deal? You can get the upgrade license here. Just download the new version and replace the old one. Your 1.w.x license will cover all updates that have the same major version number, i.e. all 1.y.z versions. The same is true for updates from 2.w.x to 2.y.z or 3.a.b to 3.c.d. However, to update from 1.x to 2.x, 2.x to 3.x, or 3.x to 4.x you will have to purchase an upgrade. Wonder why you should update? Here's why. The license key will be emailed to you. Then start beaTunes and enter the license information into the registration dialog. Should it not pop up automatically, go to the Help menu and select Register... then enter the license information. If you are using an Early Access version, check this website for a new Early Access version or the final release. In your support request, please state the versions of beaTunes, iTunes, and macOS/Windows you are using. Furthermore, please let us know how many songs are in your library and what hardware you are running. No. For the 64 bit versions of beaTunes 4 and later you don't need any other software - however, beaTunes works very well together with iTunes. For beaTunes 4/4.5 for 32-bit Windows and beaTunes 3 you still need QuickTime, but not iTunes. On macOS, QuickTime is always installed as part of the operating system. On Windows, QuickTime comes with iTunes. If you don't have iTunes installed, you can download QuickTime from here. Starting with beaTunes 4.6, QuickTime is not longer required at all. How can I export BPM, key, and playlists to applications like Traktor? What is the 'mood' good for? What is the 'color' good for? What is the 'key' good for? How can I tag songs and why should I? How can I cancel the analysis of one or more songs? How can I cancel the analysis of all songs? The BPM estimated by beaTunes is twice/half as fast as the actual BPM. Why is that and how can I fix this? How can I make beaTunes analyze protected tracks? Every time I switch from another application to beaTunes, I see the blue spinning ball and beaTunes is slow. What's happening? How can I update to a new version of beaTunes? Do I have to analyze all songs in my music library in one session? How can I lookup titles and artists for tracks that have no information associated with them? I have multiple iTunes libraries. How can I work with beaTunes? With analysis you can calculate metadata like key and tempo directly from your audio files. Inspection allows you to find discrepancies in your files' textual metadata. E.g. an artist name spelled in multiple different ways or an album marked as compilation even though all songs are by the same artist. Finally, playlist creation lets you to create new playlists that follow custom rules you can define in the application's preferences. Since most of these rules take advantage of tempo, color, and other values, it makes sense to first analyze and inspect, and then create playlists. To get a quick overview on playlist creation, check out the video below. It belongs to the post 5 Ways To Create Better DJ Sets With beaTunes by DigitalDJTips.com. Finally, you can find a whole series of articles, explaining the concept and some finer points in detail here. If you are using an iTunes-based collection, all playlists and BPM values are immediately reflected in iTunes. This is not the case when using a folder-based collection. So, if you are using iTunes as your regular player, it makes sense to use an iTunes-based collection. If you are mainly using other applications than iTunes for playback, it makes sense to use a folder-based collection. All computed values are immediately written to your files and can be imported from there by third party applications. To export playlists, you can right-click on the list in question, choose a format (Traktor supports M3U, but not M3U8), and export. Depending on the kind of library and your preferences, beaTunes writes certain values like key into your files—or not. You can read more about where beaTunes stores its data in this article. beaTunes allows you to tag your songs with a color-coded mood. Note that this is different from the beaTunes 'color' as it is clearly defined, which color stands for which mood. To set the mood, select one or multiple songs and open the Get Info context dialog. In its last tab you can click into a colored square to select a mood (for more info see here). You can also automatically infer moods from Last.fm tags or from AcousticBrainz data. To do so, select the songs you want to analyze, click on the 'Analyze' button in the toolbar and select the Estimate Mood task. Of course you can use moods when configuring match rules, so that you can easily find songs with similar mood in your collection. The song 'color' determined by beaTunes is a measure of how a song sounds in relationship to the other songs in your library. I.e. blue songs sound more similar to each other than to red songs. Starting with beaTunes 4, colors are computed in a standard way, so that a song's color is always the same no matter which library it is in. beaTunes 5 has renamed the color familiar from beaTunes 4 to timbre. In its place, a new, more comprehensive color was put. It contains information about timbre as well as rhythm. Knowing the key a song is in, can help you picking songs that match harmonically. This is in essence the basis for a DJ technique called harmonic mixing. Songs in the same key, relative, dominant or subdominant keys usually mix well, while others often sound dissonant. When creating Matchlists with beaTunes, the Matching Key rule takes exactly these relationships into account when calculating the match quality, helping you to create harmonious mixes. Additionally to the musical key names, beaTunes displays their names in Open Key Notation, a numeric mapping of the regular key names, suitable for recognizing matching keys more quickly. Starting with beaTunes 4.0.4, you can configure in the general preferences how you want beaTunes to render/display your keys. Starting with version 4.5, you can also configure how beaTunes should embed your keys (ID3 TKEY or Open Key Notation) into the key tag. For this to work, embedding of non-iTunes field has to be turned on, if you are using an iTunes-based library. Furthermore, you can ask beaTunes to copy the key value to the comment field. This is done in the configuration of the key analysis task. beaTunes allows you to assign tags to individual songs. This does not only help to improve the match process, but can also be very convenient, when searching for a particular song or group of songs. In order to assign a tag, just select a song and click on its tag column (slow click). A dialog will pop up, showing an input field for your tags and a tag cloud of already used tags. Using the tag cloud for entering the new tags helps keeping your library consistent. You can also tag songs through the Get Info dialog. Note, that you can automatically import tags from Last.fm. Go to the Task Queue and select the songs that you want to cancel the analysis of. Control-Click (Mac) or Right-Click (Windows) and choose Cancel Task. Go to the Tools menu and and select Clear Task Queue. Starting with version 4, beaTunes contains a special algorithm that actively tries to avoid this so called octave error. However, the current state of the art does not allow for 100% correct results. Should you encounter many octave errors, you might want to specify the approximate range of BPM you expect, when you start the analysis. However, sometimes this is hard - especially when you analyze hundreds of songs. Therefore beaTunes offers several ways to correct the measured BPM. Select the song that has the wrong BPM. Click on the BPM column of that song. The BPM field becomes editable. Enter the correct value or swap values with the alternative value by clicking on the arrow. You can also select the song, Control-Click (Mac) or Right-Click (Windows) and select 'Tap Beat' from the context menu. This allows you to tap the beat and have beaTunes store the result. If you know that some songs are actually twice or half as fast, select the songs you want to change, then select 'Double BPM' or 'Halve BPM' from the 'Edit' menu. There is no easy way to achieve this. DRM protected tracks cannot be analyzed. The reason is obvious: If beaTunes could easily access the raw audio data for analysis, it could just as easily create an unprotected copy. Until 2009 most songs purchased from the iTunes Store were DRM protected. All songs downloaded via Apple Music are also DRM protected. As a DRM-free alternative to the iTunes Store you might want to check out Amazon's MP3 store. Whenever you switch from another application to beaTunes, beaTunes synchronizes with iTunes to catch up on external changes to the iTunes Music Library. With large libraries, this can be a little annoying. Since in many cases there are either no or only insignificant changes, you can turn this feature off. Just go to Preferences > General and uncheck Synchronize with iTunes on window activation. You can still synchronize with iTunes manually by selecting File > Synchronize or Shift-Command-Y on Mac and Shift-Control-Y on Windows. On macOS, just replace your old beaTunes app. If macOS asks you whether you want to replace the old application, say yes. On Windows, first stop beaTunes, then simply run the installer—old versions will be removed. No. You can shutdown beaTunes at any time and resume analysis simply by starting beaTunes again. If you ripped a lot of songs while you were offline or simply before CDDB was used, your tracks may have meaningless titles like 01-Track.mp3. beaTunes lets you fix this. Analyze these songs with the Import metadata from online resources option (Internet connection required). Choose carefully how the new data should be imported, to make sure that you don't accidentally loose any of your existing data. If you don't trust the automatic process you can choose Don't import song info, just look up ID. After completion of the analysis, open the Get Info dialog on one of the tracks. beaTunes will now try to obtain information about the song and underline any existing data that it thinks is wrong. Depending on your OS, Right- or Control-click on the underlined item and beaTunes will suggest one or more alternatives. To find out even more about a particular song using MusicBrainz, Amazon or Discogs, you may also want to use the Open in... feature. Right- or Control-Click on a song and choose Open in.... Then select one of the options and a corresponding page will open in your browser. Please note that MusicBrainz is a non-profit effort. It depends on individuals like yourself to provide high quality data. Consider contributing by volunteering as an editor. Typically beaTunes autodetects the library you are currently working with. 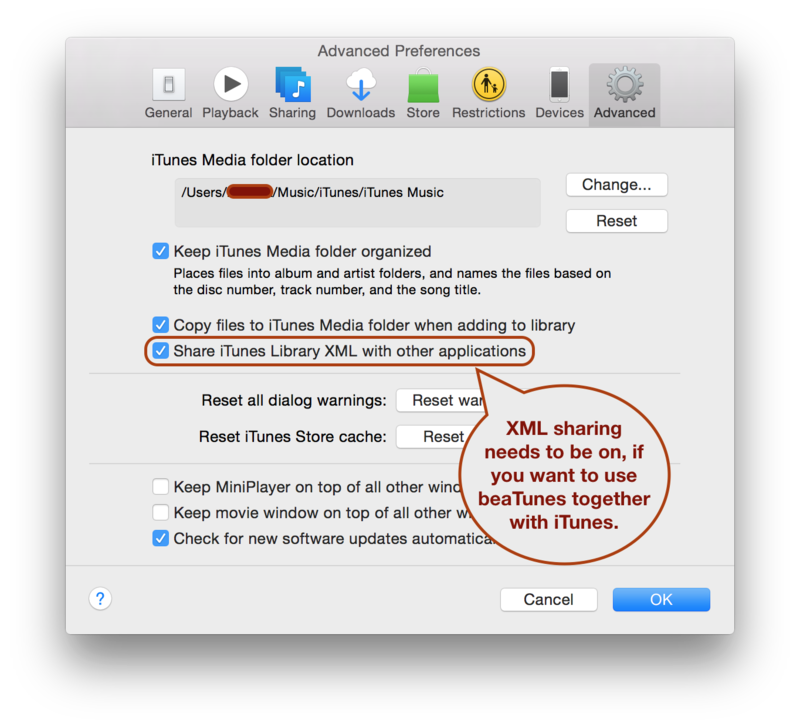 It will prompt you to configure the libary you are using, should it not find the right iTunes (Music) Library.xml file. To do so, open the beaTunes Preferences dialog and go to the General tab. There you find a dropdown box with the currently configured libraries and also a [+] button that lets you setup a new library. In the case of folder-based libraries beaTunes manipulates the files directly. In the case of iTunes-based libraries, beaTunes tells iTunes to manipulate the files. By telling iTunes about it, beaTunes also ensures that iTunes always shows current information and does not have to rescan the files. To check what kind of library you have, open the beaTunes preferences, select the General tab and check out the entry under the heading Music Library. If it starts with "FileSystem", you have a folder-based library. To create an iTunes-based library in beaTunes 4, open the File menu and choose New Library. You can choose between folder and iTunes. Choose iTunes. Then, in the file open dialog, select your iTunes Library.xml file. Based on the library file, beaTunes will find your music files, wherever they are. I encountered a Java OutOfMemoryError. What now? How can I add my own analysis code? Is there a plugin API? Analysis takes a long time. Is this because beaTunes is written in Java? You can find information about this issue here. beaTunes is written in a way that makes it possible to easily add custom components and inspections. Some more info can be found in the beaTunes plugin API section. Please contact me via the support forum with any questions you might have. If beaTunes was written in assembler, analysis would probably be faster. Chances are, that beaTunes would also crash more often. Contrary to common perception, the speed of Java has caught up quite a bit compared to early versions from more than fifteen years ago. Pretty much every recent benchmark that compares Java with C or C++ has concluded that Java is typically a little slower than C and in many cases almost as fast as C++. This means that nowadays mainly the code quality determines whether a C implementation is faster than a Java implementation. So the answer is no. In fact the first step of the analysis is the decoding of the compressed audio file (mp3, aac, etc) into raw audio data. During this step beaTunes uses the mostly native SampledSP libraries. Additionally, there are some other analysis steps like FFT that are done natively to take advantage of special hardware capabilities. While the CPU has certainly some impact on processing speeds, for modern computers I/O speed is more likely the bottleneck for beaTunes' analysis. Tasks like automatic segmentation or ReplayGain require beaTunes to read the whole file, usually a couple of megabytes. If this happens over a network from a slow NAS, it is going to take a lot longer than if the file is stored on a local SSD. Even an external USB drive can be fairly slow. If you must use USB, make sure it's USB3.